The Wright Wreport: Get Your Swagger on in a ... Swacket? Yes! Get Your Swagger on in a ... Swacket? Yes! The Harputs Own wool swacket ($425.00) for women and lightweight wool swacket ($500) for women and men are designed with strategically placed fasteners that tranform them into different shapes. Photos from Harputs of San Francisco Web site. HEAD’S UP: Here it is past mid-December and holiday shopping isn't yet an item on the to-do list. What’s a body to do? One option is to give money. Everybody needs money, right. Well … almost everybody does. Yet the idea of gifting money seems a bit slapdash and last-minute, which it is, of course. Never fear. The elves at VEVLYN’S PEN are here to help in what has become a tradition. Continuing through 24 Dec., we will introduce one or a series of products, items and brands that we believe is worthy of consideration as a holiday gift(s). And … we’re off !!!! SOME days a body just wants to mix it up. That’s what convertible clothing is all about – one frock worn several ways. Of course it’s also about more space in the closet and more dollars in the wallet. And with the airlines charging for everything from soup to nuts, the lighter the suitcase the better. Hence, convertible clothing. Once barely a cottage industry, it has transformed into a full-blown niche category. Leading the way, of course, are the various wrap dresses. Popular ones bear names such as American Apparel, Donna Karan, Target and Etsy. In the category, too, are pants, tops, shirts and accessories such as jewelry, cowls and scarves. The market, though, is lacking anything approaching a glut of stylish outerwear jackets. This is good news for the West Coast label, Harputs Own. The line also includes coats, dresses, tops, pants, rompers, vests and so on. The American Apparel cotton spandex jersey bandeau pencil dress ($41) can be worn at least a dozen different ways. Photo from American Apparel Web site. Made from cashmere, wool, nylon and cotton, Harputs Own jackets ($375-$800), or swackets, are small wonders. Put one on and wear it open and it is an ordinary, yet stylish shawl-collared affair. One of the secrets is the placement of snap fasteners. Grab the hem of the jacket and wrap it over the shoulders and snap. 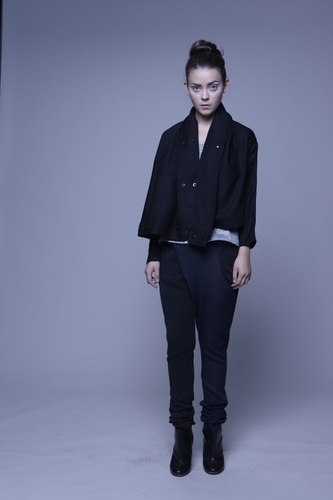 The result is a jacket with an asymmetrical cowl-neck and lapels. Put it on upside down to create a cowlneck-peekaboo/crisscross-at-the-waist effect. Yours Truly, who sports the Black Wool Swacket ($425.00, pictured above at left) can not do it proper justice in mere words. See the You Tube demo: http://www.youtube.com/watch?v=QURfFDO4Gq8. The swackets are designed to be worn in more ways than are shown in the video. Each individual owner is encouraged to unlock the secrets to his/her jacket. The brains behind the outfits is Gus Harput, who sells his creations out of his shop, Harputs of San Francisco, located in the city by the bay. What inspired Gus to create the line? … More shortly. Visit http://www.harputsown.com/index.html to learn more about Harput’s Own.